As a geocacher, the term "GPS" usually reminds me of using a device to find a hidden treasure. Thus, I kept doing a double take when I encountered Cisco's GPS: Global Problem Solvers at ISTE 2018. 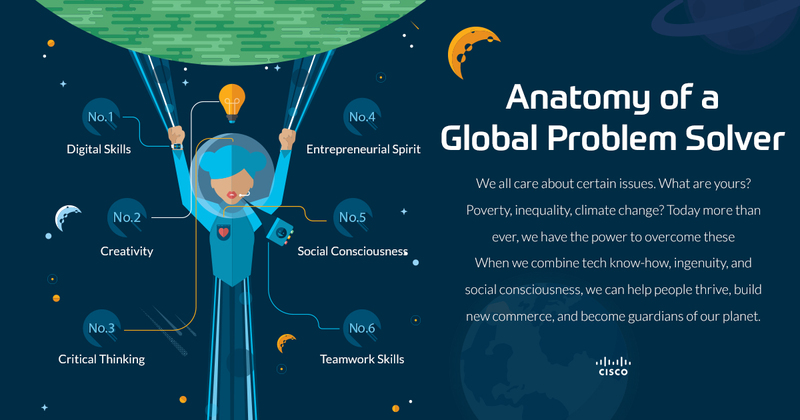 This is part of Cisco's Corporate Social Responsibility (CSR) program, but is unique in that it is aimed primarily at middle schoolers. As a career middle level teacher, first in science and then as a librarian, I can see many ways this series could be integrated. At this point, there are two seasons of short videos, detailing stories of a group of international students with different talents tackling social problems; the first deals with access to water in Malawi, the second the aftermath of a hurricane in Florida. Each comes with a complete guide, suggested questions, and a useful bibliography of background materials. As a librarian, I could see collaborating with teachers from different disciplines to use this series as a springboard for groups of students to tackle a situation of their choice. The videos could be used in a blended learning environment, a whole-class structure, or a station-rotation situation, gradually rolled out or used consecutively. It would be ideal for a middle school team of teachers to use as an interdisciplinary project, or even a pair of teachers. My husband and I attended the launch party for GPS: The Series, compete with the mascot, Huti. 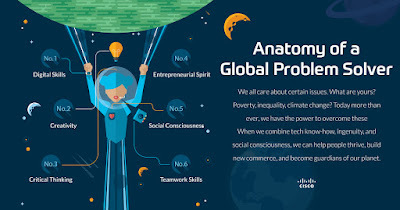 "..each school within a school corporation shall include interdisciplinary employability skills standards established by the department of education..."
GPS the series could be used to address this: it incorporates such skills as critical thinking, problem solving, social entrepreneurship, and collaboration. In fact, this is one of the things I liked about introducing it to students; rather than asking, "What are your talents? Are you good at math? writing? science," it does not pigeonhole students by subject. Rather, it asks, "Are you creative? A team leader? Digitally talented?" It encourages students to see their talents in a different light. I plan to share this widely with my fellow librarians and middle school teachers. When attending an event like ISTE, you often want to hear from those "in the trenches." 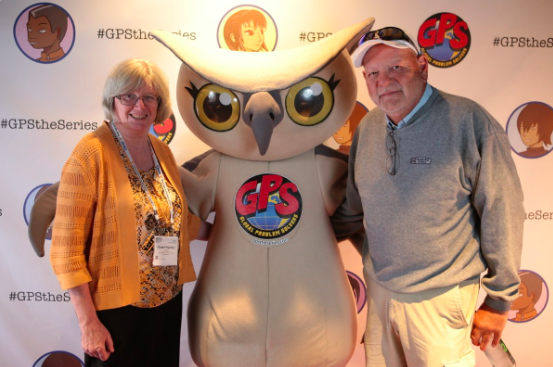 GPS had this with teachers Edgar Ochoa and Christa Tropin. They were among Arizona teachers who piloted the series and were indefatigable in their explanations and answering questions in a variety of formats. Their students indeed used GPS as a model and completed projects and presented them in a culminating science-fair type environment with community members present. During ISTE, when confronted with tech failures, raucous crowds at a nearby booth, room and schedule changes, they responded in true master teacher fashion: they didn't miss a beat. You can gain some different perspectives about the program from the other educators who were spreading awareness: blogs from Valerie Lewis, Marialice Curran, & Shelly Terrell, this podcast from Shawn McGirr (episode 395), and this review from EdTech. Director of Operations for the Indiana Middle Level Education Association. Former teacher librarian and science teacher; I spent almost 40 years in middle school. I really enjoy attending edcamps, ISTE, ICE, ILF, and other learning opps. As one of my friends said, "Susie, for you, Professional Development IS a vacation." Share book reviews and ratings with Susie, and even join a book club on Goodreads.